An old-fashioned pub tucked away between an industrial estate and housing estate in Bermondsey. Inside, the pub resembles a 1960s pub museum: it's been well-maintained but unmodernised for many years. One wall bears a blue plaque declaring it the 1972 Evening Standard pub of the year. Laura visited on a Saturday afternoon in January 2009 when the pub was very quiet, and had a long chat with the landlord, Pat. 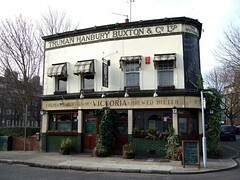 Pat told us that the pub is often used for filming due to its authentic appearance, and is heavily featured in the 2009 "reimagining" of the classic London series Minder. (Pat even invited us to a Minder party that Wednesday, to watch the show and have a beer; he was hoping one or two of the stars might show up!). The pub serves food at lunchtimes Monday to Friday. It also has a late licence until 2am on Fridays and Saturdays, and there is often a DJ (there's a separate DJ booth in the back corner near the toilets). There is selection of cask ales available, with four handpulls, but only London Pride on the day we visited (£2.60/pint). Pat told us that the previous night (a Friday late licence) had been particularly busy and that all the other ales had run out. There is also the usual selection of lagers - Stella, Carlsberg, etc. There is a very large selection of spirits behind the bar, especially whiskies. Laura was impressed by the ladies' loos, not least because there were fresh flowers! There's a big screen showing sports, and another smaller TV on the other side of the bar, though the sound was turned down on our visit. There's also a fire in one corner (though it doesn't appear to be an open fire, and doesn't give off a huge amount of heat). Overall this is a lovely unreconstructed pub, with a very friendly landlord and a strong regular clientele. It has the feel of a "proper" old boozer. Worth a visit if you're in the area. Last visited by Laura and Ewan, 31 January 2009. Food times taken from sign in bar, January 2009. Last edited 2013-05-10 08:12:30 (version 10; diff). List all versions. Page last edited 2013-05-10 08:12:30 (version 10).